The goal for The Money Sprout blog has always been to focus on ways to build new income streams … big or small. And by building these “side hustles”, we can work towards financial independence. For the most part, the only significant side income stream that our family has built (so far) is our dividend portfolio of stocks. We expect to earn an extra $2,400 this year in dividends. That extra income is great and it will grow to $3,000 next year. But that extra income is not enough to replace our regular income from my job … so we need to focus on adding other sustainable income streams. So … our latest focus is to start building up one of our blogs where we can earn $5,000+ per month in sustainable income by next June (2018). If that goes well, then we may try and repeat that process into a second and third blog. Here is a little bit more information about our first blog that we plan to earn sustainable income from in the health and fitness niche. After personal finance, my second passion is to talk about health and fitness. That is one of the reasons why I started a blog on the topic over 3 years ago. The bad news is that I never spent much time on the blog … only posting every couple of months. I didn’t have any plan or purpose for the site and treated it more like a hobby. Well, my focus has now switched from blogging as a hobby to blogging as a source of side income. To date, the visitors to the health and fitness blog have been limited and there have been no earnings. And actually … instead of earning any income, the site has incurred several expenses including – domain name, hosting, and theme costs. So overall, my heath and fitness site has been cash flow negative since it first started. So just to be clear … even though I am starting this blogging income campaign with an existing site … it has very little traffic and has lost money. At the beginning of every month, I share a few statistics … including the social media accounts tied to this site. The plan is too increase these stats month by month … and then next year I can look back and see how much my site has grown. Note – For now, I am concentrating my social media efforts to mostly Pinterest, Twitter, and Instagram. I am planning to leverage the power of Pinterest to try and get a bunch of traffic right away. I also figure that Twitter and Instagram tend to be popular choices for sharing content on the Health and Fitness industry … so I will work to build up my following in those as well..
Out of the 3 social media networks, Pinterest has been the main focus starting out because of the potential for good traffic right away. However, recently I have been putting more effort into growing my Twitter following as you can see by the numbers. I haven’t really spent much time growing our Instagram account so far. Our Twitter following grew by 40 last month … all due to a new hack I have found. I will give this hack one more month to see if it is sustainable, but so far it seems to be working. Despite the growth we saw in 2 of our social media accounts, I am still struggling with one very important goal. We still don’t have a single email subscriber yet. I plan to start focusing on this in October. 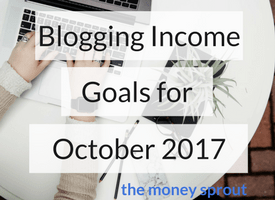 Blogging Income Goals for September – How did we do? We set several high level goals for September on our health and fitness blog. Our long term goal is to earn $5,000 per month in sustainable income by June 2018. Not sure we are going to hit that target at this point as there is a ton of work that will need to be done over the next 9 months. I finally decided to remove the remaining 3 articles on the site that were leftover from years ago. They really didn’t fit the direction I plan to take this site, so they were removed. We were able to hit this goal of writing 3 new articles that were 1,500+ words in length. Each of these posts were well over 1,500 words coming in at: #1 – 1,955 words, #2 – 2,455 words, and #3 – 1,809 words. I also put in some time trying to promote this content on Twitter and Pinterest. Missed this target by 8 followers. I have been putting in a bunch of time growing this Pinterest account by using Tailwind. Eventually, the followers will come as I keep working this social media account. My new hack seems to be working as I ended last month with 110 followers, which was 40 more than previously. I have also been trying to stay more active in the Twitter world by replying to other bloggers tweets about health and fitness. We went backwards on this one. I think all it will take is to spend some time, like I am on Twitter interacting with others. Hopefully I will squeeze out some time in October to focus on this. There is no doubt that we saw our best month so far in September … and that was after a good month in August. But there is still a ton of work to be done to build and grow this site into a sustainable income machine. This has become my number #1 goal now. Even one subscriber would make me feel better. I am going to start researching better ways to attract subscribers and probably put together some FREE guide to offer readers for signing up. I still need to put out good content on the site and found the 3 articles of 1,500 words or more does the trick for my schedule. I would certainly like to publish more … but I want to focus on quality first and foremost. This goal was not met last month … I fell 8 followers short. As mentioned earlier, I have focused a bunch of time growing this Pinterest account and I think the followers will come in time. I am confident I can get another 40 Twitter followers if I keep the same strategy I have been using. Hopefully that will lead to more traffic to the site and my first email subscriber! I am going to keep this goal the same as last month. I actually lost 3 followers from the previous month … so no sense of setting an unrealistic goal. Moving forward, I plan to set goals each month for our social media followers. I also plan to start setting goals for email subscribers … but I need to figure out how to get at least one first! As my site grows and matures, I think using social media (mostly Pinterest) is the quickest way to get traffic and eventually income. While not an actual goal listed above, I plan to do some research over the next couple weeks on growing my email list.